These probes are schematic symbols with special properties. When you place a fixed probe on the schematic, the probed value at the point where you place the probe will be plotted each time you run the simulation. Current probes and power probes must be placed directly over a part pin. They will have no function if they are not and a warning message will be displayed. The elements of each tabbed sheet are explained below. History Controls the number of curves from previous runs that will be displayed. If set to 1, only the latest result will be shown. If set to a value greater than one, the current result and a number of previous results equal to the history depth less one will be shown. The old results will be shown in broken lines. If default is checked, the number of curves will be based on the values specified in the general options. If Separate curves is checked the history depth setting is ignored. In this case a new curve is created for each new run. Axis type Specifies how the grid and y-axis are chosen for the plotted data. 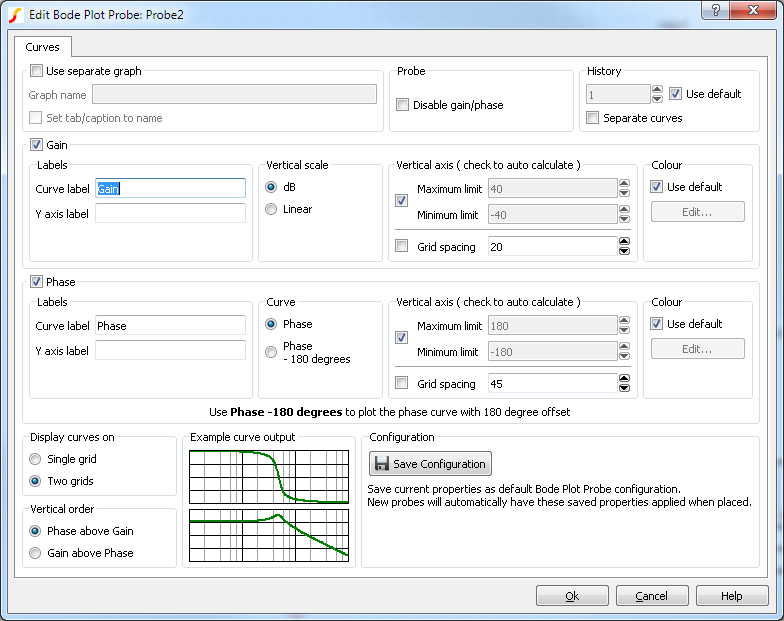 Auto Select Chooses the most suitable grid and y-axis based on the physical units of the plotted data. So voltages will be plotted on the same y-axis as other voltages and currents will be plotted on the same y-axis as other currents. Separate grids will be used if the x-axis are incompatible. For example, if an AC analysis and transient analysis are performed in the same run and the same graph sheet is forced (See Use named graph below) the results for the two analyses will automatically be placed on independent grids. If the signal is digital, a digital axis (see below) will be used for this probe. Use named grid Similar to above but grid will be shared with other probes that specify the same grid name. See diagram in section Graph Layout - Multiple Y-Axis Graphs. Use named Y-axis Uses a separate y-axis. The y-axis may be shared with other probes that specify the same axis name. This name is not used as a label for display purposes but simply as a means of identification. Axes can be labelled using the Axis Labels sheet as explained below. Digital Use a digital axis. Digital axes are placed at the top of the window and are stacked. Each one may take only a single curve. As the name suggests, these are intended for digital traces but can be used for analog signals if required. Graph Check Use Separate Graph to create a new graph sheet for the probe. 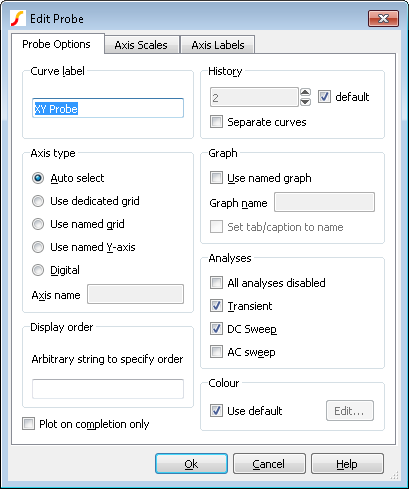 You may also supply a graph name, in which case other probes using the same name will be directed to the same graph. The graph name may also be used to force curves to the same graph when the default action would be to create a new graph. This will happen for example for a new analysis type. The results from a Transient analysis, would usually be placed on a different graph sheet to the results from an AC analysis. Specifying this option with a name will override this. Check the Set tab/caption to name box to show the graph name in the caption bar and tab of the associated graph sheet. Analyses Specifies for which analyses the probe is enabled. 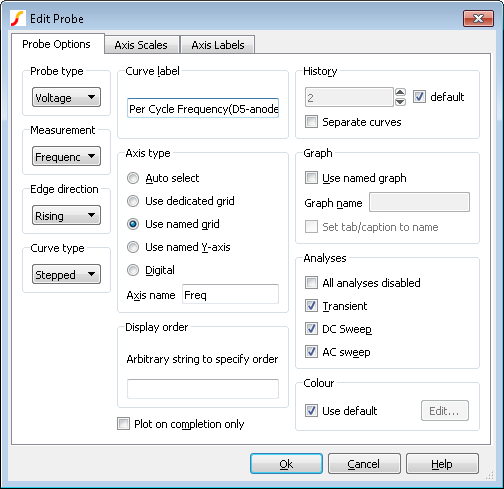 Note: Other analysis modes such as noise and sensitivity are not included because these do not support schematic cross probing of current or voltage. For SIMPLIS mode, a Periodic Operating Point (POP) option is also available. Display order Enter a string to control the grid display order. The value is arbitrary and will not be displayed. To force the curve to be placed above other curves that don't use this value, prefix the name with '!'. The '!' character has a low ASCII value. Conversely, use '~' to force curve to be displayed after other curves. Colour Check Use default to minimise duplicate colours on the same graph by allowing the colour to be chosen automatically. Alternatively uncheck, this box and then press Edit... to select a colour of your choice. In this case the trace always has the same colour. 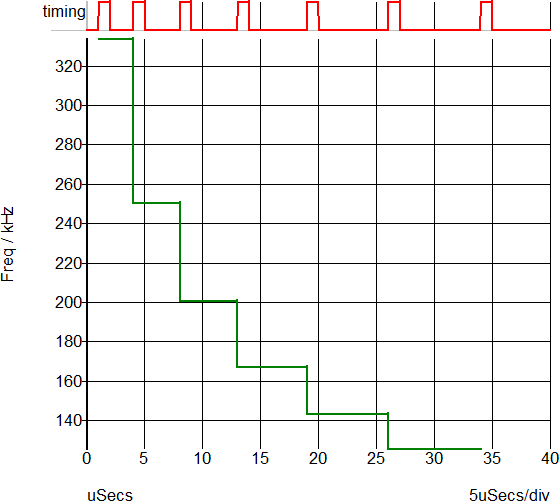 If checked, incremental plotting is disabled; that is, the plot does not appear until the run is complete. If not checked, the curve updates regularly during the course of the run. Note: For some expressions, it is not possible to incrementally plot the data; if this is the case incremental plotting is disabled and this check box is ignored. Lin/Log/Auto Specify whether you want X-Axis to be linear or logarithmic. If you select Auto, the axis (X or Y) will be set to log if the x values are logarithmically spaced. For the Y-axis, it is also necessary that the curve values are positive for a log axis to be selected. If you select No change, the axis scales remain as they are; this is relevant only if you are adding to an existing graph. If you select Auto scale, the axis scales are based on the minimum and maximum values of the curve. If you select Defined, enter values in the Min and Max fields. Curves created by fixed probes store their history which can be viewed at any time. The picture below shows how the current result and one previous result are displayed. The stored history depth (not the displayed history depth) may be changed using the DataHistoryDepth option setting. This has a default value of 4 meaning that the current result and three previous results will be stored. Note that in some circumstances the depth will be restricted to preserve memory. Select device and press F7 in the usual manner. A dialog box will show similar to that shown in Bus Probe Options. But you will notice an additional tabbed sheet titled Probe Options. This allows you to select an axis type and graph in a similar manner to that described above for fixed voltage and current probes. Fixed probes may successfully be used in hierarchical designs. If placed in a child schematic, a plot will be produced for all instances of that child and the labels for each curve will be prefixed with the child reference. Place a probe on the circuit in the normal way. As with the other probes, the curve can be output to any graph and axis. Per Cycle Probes are compatible with both simulators. Multiple Selections: Multiple probes can be selected and edited simultaneously. The per-cycle measurement can also be applied to amplitude of an input voltage or current. For example, you can plot the mean value of a switching power converter output with the mean value being calculated on a per-cycle basis. 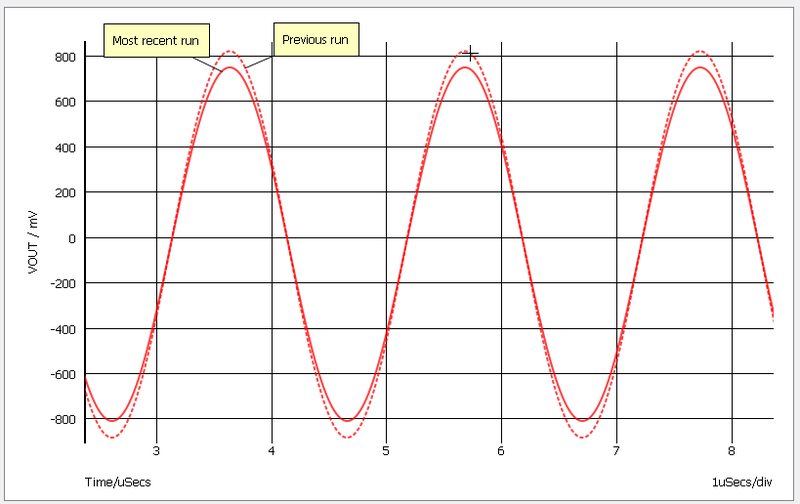 This example is show below - the mean value of a converter output voltage is plotted in a per-cycle manner. 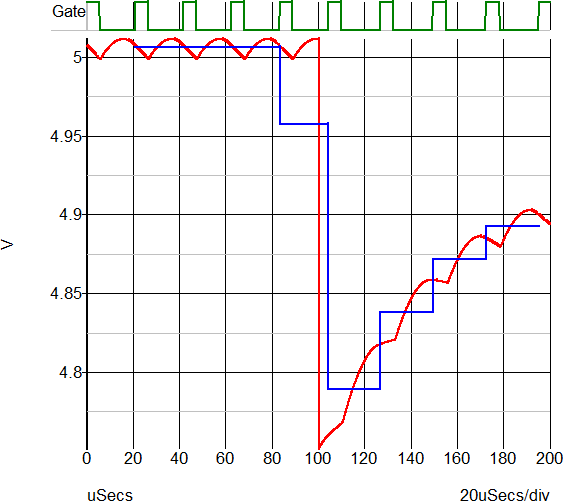 The gate voltage is used to determine the timing edge information. 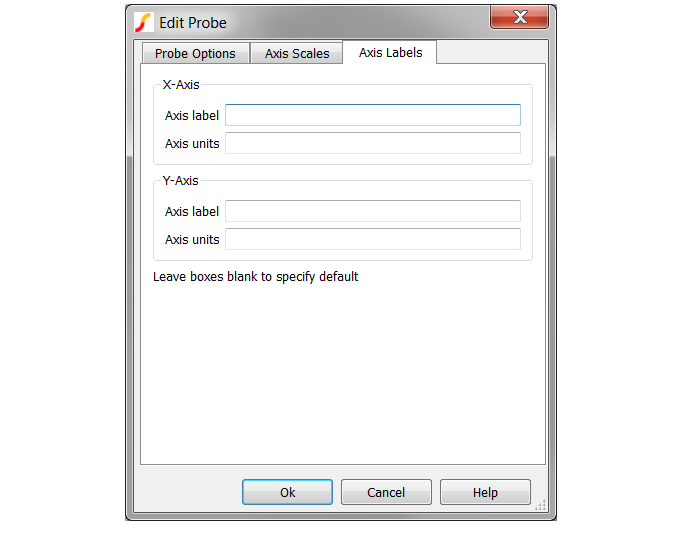 Double click the symbol on the schematic to open the editing dialog to the Probe Options tab. Make the appropriate changes on the three tabs as explained below. The following tab allows you to define general probe options, which are explained in the table below. The value is arbitrary and will not be displayed. To force the curve to be placed above other curves that do not use this value, prefix the name with '!'. The '!' character has a low ASCII value. Conversely, use '~' to force curve to be displayed after other curves. Plot on completion only This option is not available with per-cycle probes and the setting of the check box will be ignored. The following tab allows you to define the scale for the X-axis and for the Y-axis as explained in the table below. 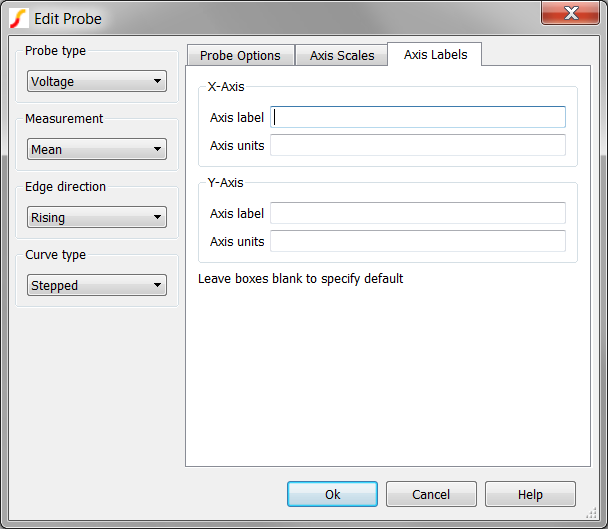 To specify axis labels and units, click the Axis Labels tab, and enter values as needed. Note: If any box is left blank, a default value is used or remains unchanged if the axis already has a defined label. Simulator: This device is compatible with the SIMetrix and SIMPLIS simulators. The value is arbitrary and will not be displayed. To force the curve to be placed above other curves that don’t use this value, prefix the name with '!'. The '!' character has a low ASCII value. Conversely, use '~' to force curve to be displayed after other curves. 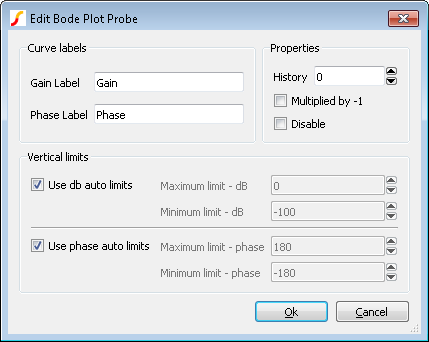 Plot on completion only This option is not available with XY Probes and the check box setting will be ignored. The Bode Plot Probe with Measurements generates plots for the gain and phase of the ratio of two voltages. The probe can be configured to plot only the gain or phase, or both gain and phase. If default is checked, history depth will be based on the values specified in the general options. Uncheck to enter minimum and maxium values for the limits. The change the default sequence of colours from the command shell menu, select File > Options > Colour For additional information see Colours and Fonts. Note: This field appears in both the Gain and Phase groups on the dialog. This basic version is useful for quick checks and for compatibility with versions 7.0 or earlier. 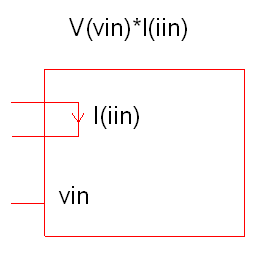 Vertical Limits Divided into two parts to allow setting of axis limits for phase and gain plots. A fixed Fourier probe is available which will perform a spectral analysis on a node voltage. To place this probe, select menu Probes > Place Fourier Voltage Probe. 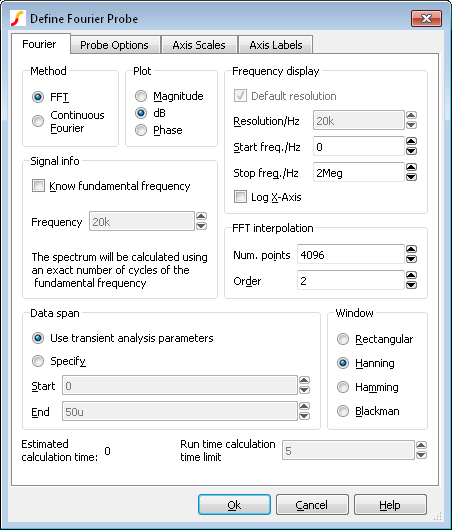 The settings are similar to that for random Fourier probe plotting as described here: Fourier Analysis. The documentation is repeated here for convenience. The simple rule is: use FFT unless the signal being examined has very large high frequency components as would be the case for narrow sharp pulses. If using the Continuous Fourier method, you can enter a maximum time limit to calculate the Fourier spectrum. If the limit is exceeded, the calculation will abort and no display will be made. The Continuous Fourier calculation time can be excessive but cannot be predicted before the simulation is started as it is necessary to know the number of simulation time points to be processed. For the FFT method, the simulation time can be estimated to a reasonable accuracy before the simulation and this estimate will be displayed labelled Estimated calculation time:. The result plotted will be the product of the voltage on vin and the current in iin. The arbitrary probe works in SIMPLIS simulations. The Non-linear transfer function device is a SIMetrix-only device. 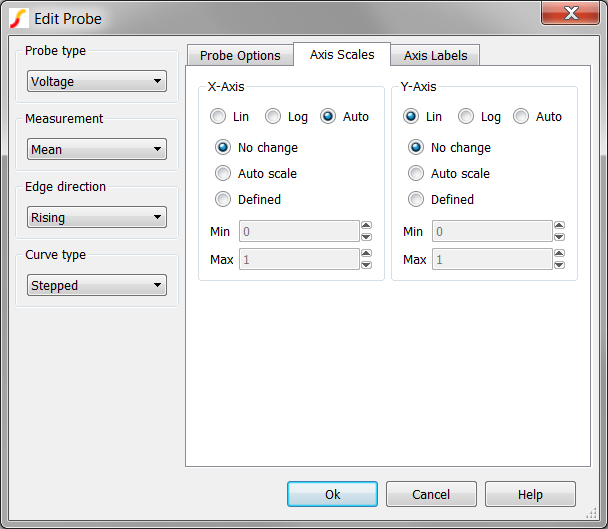 The options in the Multi-step mode group control the behaviour of the probe with multi-step analyses. Multiple curves. This is the normal mode and will create groups of curves. Performance analysis. A performance analysis based on a goal function will be performed. 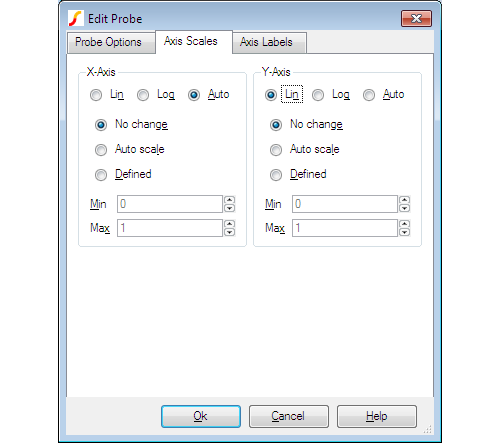 In this mode a goal function must be entered for the probe expression. A single curve will be created of the value of the goal function against the swept variable. Histogram. Used for Monte Carlo analyses. In this mode a goal function must be entered for the probe expression. A histogram plot will be created of the goal function results. Options for creating histograms. See above. Number of bins may be used to force a particular number of bins of the histogram. The default depends on the size of the sample and is typically half its square-root. A display of statistical calculations is displayed alongside the histogram including mean and standard deviation. 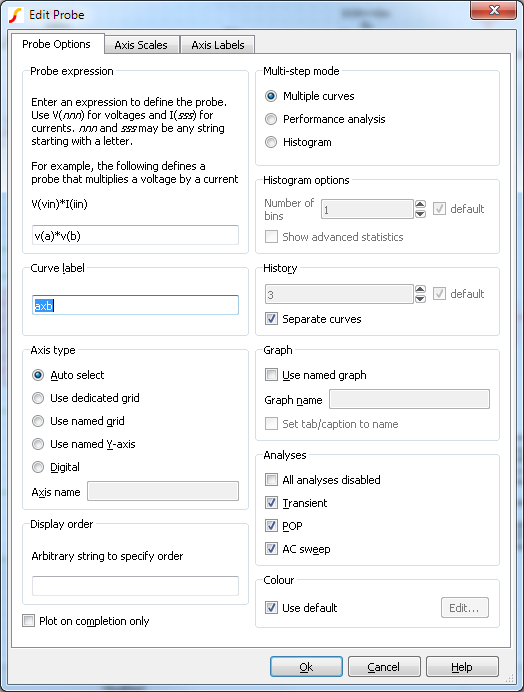 The Show advanced statistics enables additional statistics such as skewness and kurtosis. The update period of all fixed probes can be changed from the Options dialog box. Select menu File > Options > General... and click on the Graph/Probe/Data analysis tab. In the Probe update times/seconds box there are two values that can be edited. Period is the update period and Start is the delay after the simulation begins before the curves are first created.